I’ll be out and about signing books around the Adirondacks this weekend and would love to see you if you’re in the Plattsburgh or Glens Falls area. I’m particularly excited about this event because I get to hang out with my critique buddy Eric Luper, author of the gritty, action-packed YA novel BUG BOY, set in 1934 Saratoga. 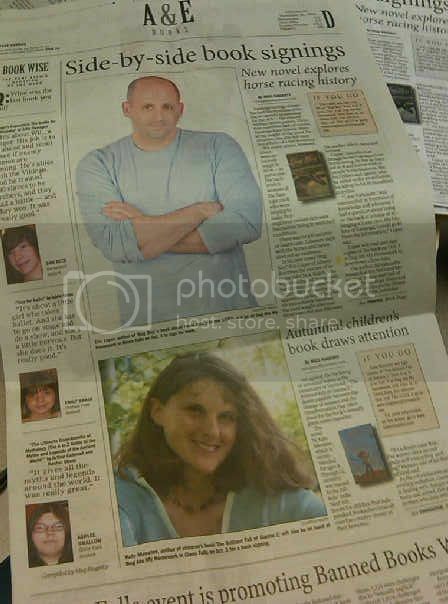 The Glens Falls Post Star just ran a feature on our upcoming event with articles about both of our new books. You can read the digital version here (Eric’s article) and here (mine). I love this review of THE BRILLIANT FALL OF GIANNA Z. from The Reading Zone, a blog written by a sixth grade teacher whose ideas I’ve followed and appreciated for a long time. Reviews from teachers who are sharing my books with readers in their classrooms are extra special to me. A reminder for teachers, librarians, & book club parents… Have you entered THE BRILLIANT FALL OF GIANNA Z. book club giveaway yet? If not, you can read all about it and enter here. We’ll be drawing a winner for a complete GIANNA Z. book club package, including up to twelve copies of the novel, some tree identification guides, bracelets, bookmarks, & more. The deadline is October 15th. L.K. Madigan is having a photography contest to promote her amazing YA debut FLASH BURNOUT. It’s coming out in a month, and it’s right up there with some of my favorites. Funny…poignant…and with a great teen voice. Anyway…look for the book at your favorite indie in October, and check out the contest while you wait. Jo Knowles is having a contest on her blog to celebrate Banned Books Week. Write a haiku about your feelings on censorship and banned books, and you’ll be entered to win a signed first edition of Jo’s recently challenged (and beautifully written) YA novel LESSONS FROM A DEAD GIRL. I hope you read whatever you want this week – and celebrate your freedom to do so.